Here is the latest on the Great Canadian Turtle Race. The CSTN office will be closed for the holidays next week – we will be back to regular updates on the race and other turtle news the first week in January. Miss Lily Rose Rosploch is having an eight-hour surgery today. She is on my mind. And as I sat down to write this blog post, I learned about the deaths of the children and teachers at Sandy Hook Elementary School. So no turtle talk today. Only love to those who are suffering. The latest in the Great Canadian Turtle Race! Who are you cheering for?! Many years ago now I got a phone call from Thunder Bay. I remember it clearly. It was one of those everyday moments that registers as oddly important for reasons you can’t immediately identify. It was from Megan, who was considering a graduate degree at Dalhousie University, which is in Halifax near our office. She wondered if she might be able to volunteer to help us with sea turtles if she came. It was an important factor in her decision, she told me. Megan volunteered while she was here. We still happily distribute the CSTN stickers she helped design as one of her school projects. We didn’t have a job to offer her in the end, and she moved on to do other great things at Kejimkujik National Park. And most people in her situation would have faded into their future and away from us. But not Megan. And this is what I think, in retrospect, made her voice on the phone stay with me. She is someone whose passion for sea turtles is one of the lenses through which she sees the world. Whenever she can slip in a plug for leatherback turtles, she does. 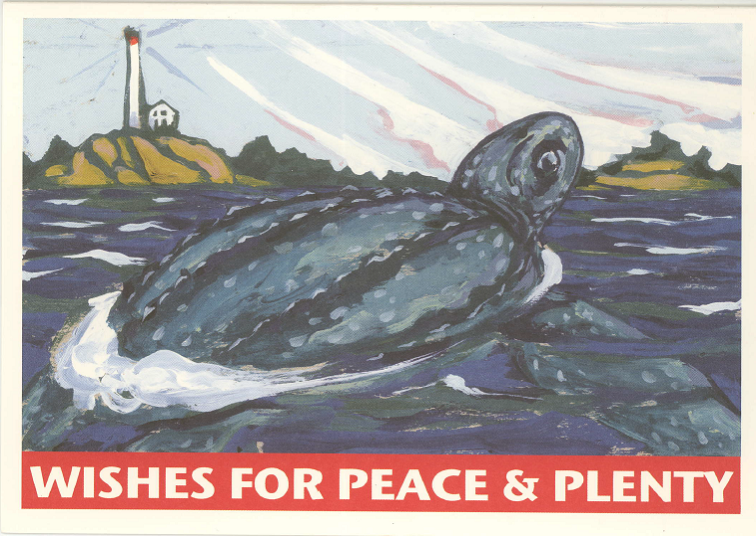 Which is why leatherbacks and the CSTN were included on the beautiful series of “endangered species” holiday cards that Mersey Tobeatic Research Institute (MTRI) produced. Megan advocated for a leatherback card and then arranged—with the support of the terrific crew at MTRI—for us to be able to package and sell them as a fundraiser for our research program. They are great cards, beautifully illustrated and—as you now know—developed from the beginning with love. Take a look at the latest positions of the turtles in the Great Canadian Turtle Race! Although the race started when the turtles were tagged this summer, this is the 8th week of us reporting to you on the status of the race. Keep checking back each week, more maps and posts to come!